The Joint PEMF is a state of the art clinical PEMF device. It is the only PEMF generating system that offers both pulsed electromagnetic frequencies through a magnetic field as well as pulsed electromagnetic frequencies through optional LED lights of Red 620 nm, Deep Red 670 nm and Infra Red 730 nm, in seven three-LED clusters. The Joint PEMF can run both magnetic disks or LED lights simultaneously or independent of one another. The Joint PEMF is designed to help reduce pain and discomfort and promote overall wellness. Runs on rechargeable batteries or connected to AC power through the battery charger. The Joint PEMF has two magnetic ports that can be used to run the two included magnetic disks, or optionally purchased LED disks, or a combination of both. Each port runs the same frequency program, so each disk generates the same frequencies. A magnetic frequency program comprises one or more sequential lines of seven frequencies that run to treat a specific condition. Each of the Joint PEMF's magnetic disks has seven magnetic coils. Each coil runs an individual frequency, so the disk runs one line of seven frequencies at a time. When one line finishes, the next line runs. Each line runs until the entire program is finished. Each magnetic coil (e.g., channel 1, channel 2, etc.) of one disk generates one frequency through a digital square-wave pattern, so one line of frequencies runs on one magnetic disk. Each magnetic disk runs the same program, so, while line # 1 runs on disk # 1, it also runs on disk # 2. Most program sets run between 30 and 60 minutes. The specific frequencies are delegated through the easy-to-use, click-and-add software, which has over 900 programs for various structure and function issues. *Neither these programs nor the manufacturer makes any claims to cure any disease, medical injury or symptom. The software is a FREE download from www.pulsedfrequency.com, with the purchase of the Joint PEMF hardware. 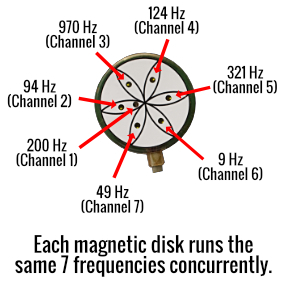 Like the included magnetic disks, each LED disk (an optional add-on) has seven channels which simultaneously generate separate frequencies to comprise a single line of a frequency program. Instead of electromagnetic coils, the LED disks utilize LED lights. The LEDs emit pulsed frequencies via red and infrared light (Red 620 nm, Deep Red 670 nm and Infra Red 730 nm). In addition to the intended effects of the pulsed frequencies, red and infrared light impart their own therapeutic benefits.